THOMASVILLE, Ga. (March 26, 2019) - Legacy Village at Plantation Manor caregiver Jerry Stewart has been named the facility’s annual Extra Mile award winner. “I could not think of another team member who consistently goes the extra mile for our residents like Jerry Stewart does. I am thrilled to have the opportunity to recognize all of his hard work, caring nature and kind spirit. I am thankful to have Jerry here to serve our residents and to be a role model for his colleagues,” said Deidre Yates, executive director of Legacy Village at Plantation Manor. 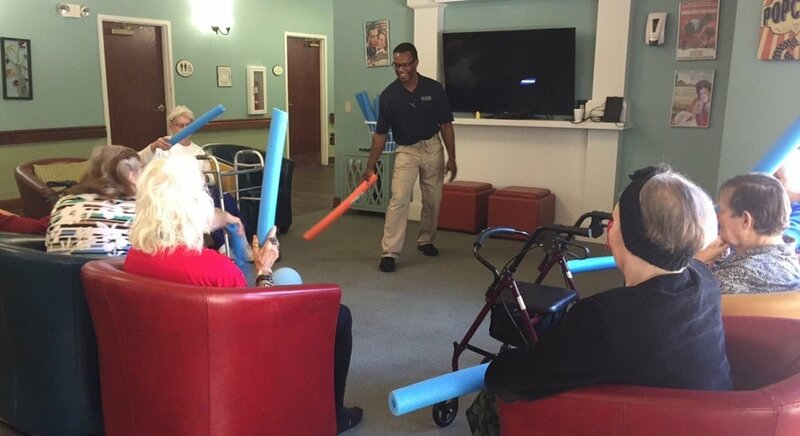 Stewart, who has served the senior living community for nearly five years, displays exemplary dedication to the residents, their families and other team members. He is known for his hard work and willingness to lend a helping hand. Stewart was selected for the annual Extra Mile award out of a pool of quarterly winners at Legacy Village at Plantation Manor due to his outstanding work. The Going the Extra Mile program encourages residents, family members and employees to nominate staff members who have performed exceptionally well in a specific scenario. The program committee reviews nominations at each facility each quarter, selecting a winner who receives a special parking space, a personalized plaque in the lobby and a $100 cash prize. The annual winner at each facility receives a $500 prize. I could not think of another team member who consistently goes the extra mile for our residents like Jerry Stewart does. PHOTO CAPTION: Legacy Village at Plantation Manor caregiver Jerry Stewart has been named the facility’s annual Extra Mile award recipient.